Etihad is, along with larger rival Emirates, one of the two official airlines of the United Arab Emirates (UAE) and has its headquarters near Abu Dhabi. Etihad is one of the top 5 largest air carriers in the Middle East and has experienced strong growth in recent years thanks to successful social media campaigns and positive reviews from flyers who've lauded Etihad's superb planes and cabins but persistently decry that it is not quite up to the standards of Emirates. 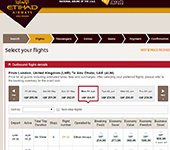 Etihad's website offers a clean and simple user experience based around a flight booking feature and special limited-time airfare deals, the majority of which arrive or depart in Abu Dhabi. 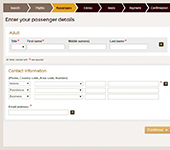 The website has clear buttons to check in online (starting 24 hours before the flight's departure), see flight status (using flight number or date and departure/arrival cities), and reserve rental cars or private drivers. Part of Etihad Airways success is due to its high number of business travelers doing to and from the UAE and, as expected, has a business class cabin which rivals the first class cabins of other airlines. Etihad's Business Class cabin features fully-reclining seats (with linens), private “Business Studios,” and 18-inch televisions. Another aspect which helps Etihad stand out is its generous baggage allowance policy of 2 free checked bags for economy class passengers. 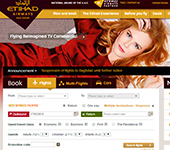 Etihad also recently launches the Etihad Equity Alliance with six other partner airlines including Aer Lingus, Air Berlin, and Virgin Australia. These partnerships let Etihad customers enjoy expanded routes around the globe via its partner airlines.